The Cerrado Protected Areas: Chapada dos Veadeiros and Emas National Parks represent the Cerrado Ecoregion, one of Earth's oldest tropical ecosystems. Chapada dos Veadeiros National Park is located in the Chapada dos Veadeiros, an ancient plateau with an estimated age of 1.8 billion years. Many endangered species are found within the park's boundaries, such as the maned wolf, capybaras, rheas and others. Emas National Park shows a typical cerrado ecosystem; a treeless savannah with tall termite houses and an interesting amount of wildlife: the giant anteater, the maned wolf, armadillos and the namesake greater rhea, among others. I have visited only one component of this inscription – Chapada dos Veaderiros National Park which is situated few hours by bus Brasilia. The visitors’ centre is located in the village called Sao Jorge where you can find an accommodation but in my opinion better place to stay is Alto Paraiso de Goias – to get there take a bus from Interstate Bus Station in Brasilia, there are 3 buses a day and the journey takes 3 hours and a half (depending on traffic while leaving the capital). At the moment I was in Alto Paraiso there was no public transportation to Sao Jorge, but 30 km distance to the entrance of the park can be covered by taxi (tourist information centre in Alto Paraiso can help to arrange) or you can hitch-hike (yes, it worked!). There’s no entry fee to the park itself and no guides are compulsory anymore unless you choose two day trail with sleeping in the park – this option must be arrange at least a day before you want to start. Other trails (waterfalls trail and canyons trail) can be done in one day if you start at 8 in the morning, when they open the park. You should remember that after 1 pm the tourists are not let in. 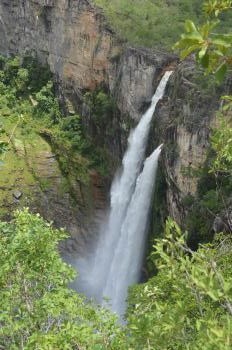 The waterfall trail will lead you to two waterfalls – this trail is more popular but in my opinion the second one, canyons trail, is more interesting because you have a chance to cross all 4 kinds of cerrado, including the most interesting savannah-like landscape. Following this trail will also lead you to some small waterfalls and the canyons look really amazing. Before starting any trail, you have to watch a short movie about the park and the security and how to behave in the park. Also you must sign a piece of paper stating that you are responsible for yourself and your safety while in the park. Few kilometres south from Sao Jorge and the park there is Vale da Lua; I am not sure if this beautiful place is part of the inscription (owner of the place say it is) but surely it is worth any visit. Especially at the end of the day, when after 10 hours of walking in the sun (there are no many places where you can hide from the sun in the park, so do not forget plenty of water, cap and suncream with filters!) you can go down into the water flowing through the lunar landscape. Here you have to pay the entrance fee, ‘cos Vale da Lua is situated on the private propriety. Just a short drive north of Brasilia, you will find this incredibly beautiful National Park that is a part of the Unesco family, it's called Chapada dos Veadeiros; entrance is from the village of San Jorge where you can choose from different paths to trek, depending on the seaon, we have chosen a track about 10km return to some very nice waterfall (Salto II of the Black river) and natural pools for swimming. Guides are now no more compulsary, you can go by your own, and the different trecks are very well marked in different colours. I recommend to stay in Alto Paraiso, there are many pousadas there waiting for tourists! Just make sure that you take the direct road from Brasilia, and dont ever attempt to pass Flores de Goias, eventhough the roads are on the map! It was a nightmare of a road, often looking rather like a riverbed, with no signboards, and even the navigation system did not work any longer, taking us about 5 hours longer than planned, but a real adventure. I have just visited one of the two parks that make up the "Cerrado Protected Areas", that is Chapada dos Veadeiros. Cerrado is the Brazilian savannah, although much greener than other savannah areas of the world. 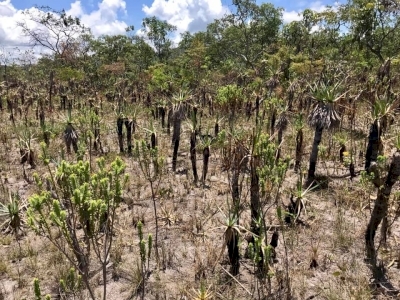 In comparison to Amazon Forest it looks poor in terms of biodiversity, but 1/3 of all Brazilian species (flora and fauna) can be found in cerrado areas. To enter the National Park of Chapadas dos Veadeiros one must hire a guide that leads you to the two possible treks, both with awesome waterfalls and natural pools to beat the heat. It usually takes a whole day to visit each one of the treks. The highest fall is 120 meters. With luck, some of the species of the cerrado can be sighted, in my case I could see the "gralha-do-campo", a black and blue bird. 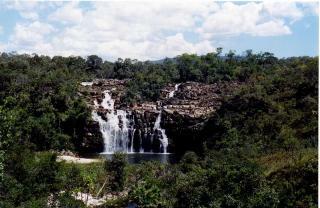 The NP is only 230 km from Brasília with plenty of hotels around the city of Alto Paraíso de Goiás. Lazarus species: Cone-billed tanager: undetected from 1938 to 2003, but rediscovered in gallery forest in Emas National Park. Extended from original TWHS: Originally only Chapada dos Veadeiros National Park (1999).